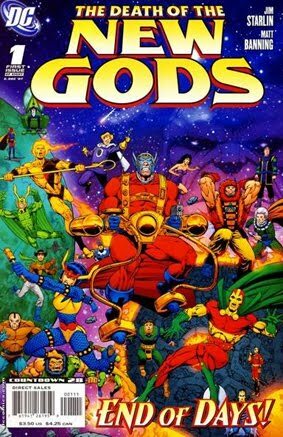 • DEATH OF THE NEW GODS #1 "So Begins... THE END"
• PLOT SUMMARY: The title says it all! For months now readers have witnessed the unimaginable and unthinkable as New Gods across the DCU have seemingly died, with Lightray's death in COUNTDOWN the biggest of them all. Now, the carnage continues but the mystery and adventure is just beginning! Jim Starlin — master of the cosmic odyssey — writes and illustrates this epic tale of death and destruction on a scale never seen before. With a cast of hundreds and cameos by the entire DCU, this intergalactic 8-part series cannot be missed!